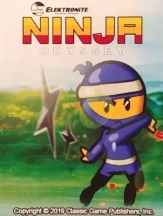 Elektronite is proud to present Ninja Odyssey for your enjoyment. The people from the remote village of Teguma always lived in peace and harmony but a few weeks ago all the animals begun to act aggressively and started attacking without provocation. Short after the villagers started to feel weak, sick, as if the life was being sucked out of them. They discovered that 3 ancestral ghosts entered our plane of existence through the 3 temples on the Teguma valley and they were draining the life force of all humans in order to return to life. The young Ninja Kasuhiro Kun still stands and he must travel to the 3 temples in order to defeat the ghosts before his life force is drained completely! And so, the biggest odyssey of his life begins! Sales will begin on Saturday, February 23rd at 10am Pacific on the Naber Hood Games website. Until then, the buy button will be disabled, but you can view the products. Shipping will proceed immediately after sales start. a) All carts will be shipped in a small bubble envelope. b) This version does not include $10 physical purchase discount. c) ROM sales are for the LTO Flash cart Only. ROMs will be encrypted to your LTO Flash cart. Your ROM purchase will not work on other multicarts, emulators or even other LTO Flash carts. You will need to send your order number and LTO Flash ID (located on the home TAB of the LTO Flash software) using the CONTACT US button on the website. Your encrypted ROM will be sent by email in a day or two. d) Includes a $10 discount for purchase of the physical game, cart only or CIB if/when that happens. It cannot be used when purchasing the cart with ROM option (#2). A user account for the website is required to receive or use this $10 discount. The discount is applied automatically to your user account when the ROM only option is purchased and shows the physical game at a discount of $10 off, so sign up before you make this purchase. One discount per customer. IMPORTANT: if you plan to purchase the ROM Only, make sure to create an account (if not already done) at the website first and use that account to make the purchase. Sorry for my ignorance but just wanted to check. If I buy the cart and LTO rom tomorrow, do I then get a $10 discount when and if the box, manual and overlays are released? Yeah, i read it but was not sure if that means the price doesn't include the discount or if that option is chosen, the discount for the box later would be applied then. The $10 discount is already factored into the CART + ROM Purchase. CART and ROM together $50. What if someone has more than one LTO Flash! cartridge? If you want Ninja Odyssey on more than one LTO Flash cart, you will need to buy that many ROMS and submit each of your LTO Flash IDs. But remember, one discount per customer for the physical version when buying ROM only. You can get the discount on all of them by purchasing the cart + ROM option at $50 multiple times. While going through the questions, I asked myself another question, "What if they bought the Cart Only and bought the ROM later?". There was nothing setup to get the ROM at a discount. Now there is. It now works both ways. If you buy the ROM only, you can see the Cart Only at $30 immediately after purchase. If you buy the Cart Only, you can see the ROM Only at $10 immediately after purchase. Also, while editing the discounts, I found that Internet Explorer had problems so I changed to Microsoft Edge which worked fine. I do not know if those problems will extend to the purchasing end, so to be safe, try to use a browser other than Internet Explorer. I know that this might seem somewhat convoluted to some people, but I appreciate the number of options and flexibilty. As someone who will buy the cart + rom and box set later (if available), I hope that this works out well and future releases will also make a rom version available early on. It's nice being able to play a game asap, but I also sometimes prefer only using my LTO cart instead of digging out a games cartridge. If enough copies are sold, do you have an idea of how long after that day the box etc will be available? I believe in an earlier post they said June?? pretty sure their printer does 3 game boxes at a time so that is likely a factor. Yeah, probably summer to fall. That looks great. Put me in for a box/manual/overlay if ever reached enough sales. Looking for that one, seems very good. Just ordered the cart and rom and another game to treat myself. I tried to purchase but the website keeps telling me that my shopping cart is empty after I continue past the billing address during checkout. I did it on my mobile using Chrome and it worked fine for me. FYI: If you're ordering the ROM, I strongly suggest you update to the latest version of the LTO Flash! UI software. Along with the bug fixes for itself, you'll get a firmware update and latest version of jzintv. Would this act as purely an update keeping all current setting and database info or would it be a fresh install of the UI? Installing the new software on your computer does not change anything on your cartridge, ROM list, or menu layout. Because it uses the files currently stored in your documents folder (in the LTO Flash subfolder), I do suggest making a backup copy of that folder "just in case". Manual testing has not found any bugs in this regard. But it can't hurt to be extra careful. Ordered a copy. This looks like a great fun game. I bought the rom and cart together and received the rom this morning. Loaded onto my lto Flashcart without issue and fired it up in my intellivision. First impressions are impressive. The sound is good but the way it looks and more importantly from a game play point of view, the way it controls is spot on. The physics of how Kasuhiro moves are great and I think even critics of the Intellivision controller will be happy with the way this controls. The lto cart automatically stores you high score as well so next time you play, it's there. This is a fantastic feature and one I hope will be included on further releases. This is a great game and one that I think many, including myself never thought we'd see the like of on Intellivision. Well done Kai Magazine and Elektronite. My collection is all CIB so was concerned the 140 mark for cart sales might not be met but after playing it, I think that'll be hit no problem. Edited by Bamse, Sun Feb 24, 2019 3:37 AM.